Up front, you need to know talking politics isn't my thing. They're going to make a bit of an appearance in this Carissa's Corner, though, just by the nature of the topic. Bear with me! It came to no surprise to TV Fanatics that the Roseanne revival premiere soared in the ratings. Everything relating to it has been indicating the revival was highly anticipated. The question I have is why Hollywood seems to be so stunned at the ratings' success. During the 2016 election process, if there was one thing that became clear, it was that a large part of the United States felt under-represented. Despite the candidate or his political views, people were grasping for representation they felt they didn't have in public office. Can the same be said for the terrific ratings Roseanne received on Tuesday? That will depend on the ratings for the remainder of the season. A good indicator for Roseanne, though, is the ratings for Roseanne Season 10 Episode 2 went up. Who was making calls to friends and family telling them to join in so they could be part of the fun? Regardless, 18.1 million viewers tuned in for a 5.1 ratings share. That's not bad, and better than the "series finale" back in 1997. It was the premiere that held the more questionable (e.g., Trump-related) content, so if that was deemed worthy of watching, then it must have all been a go. Keep in mind, though, that the Conners of 1998-1997 wouldn't have voted for Trump. The show debuted during the Reagan Administration when the US was doing reasonably well. Middle America probably didn't feel all that well-represented at that time, either, but for entirely different reasons. Someone always feels left out in the cold. The trend in Hollywood in the recent past has been to embrace a liberal agenda and to make anyone who doesn't embrace it feel embarrassed and unworthy. Worried about the T-word in relation to Roseanne, many were bracing for the worst. Sometimes, you have to have faith. 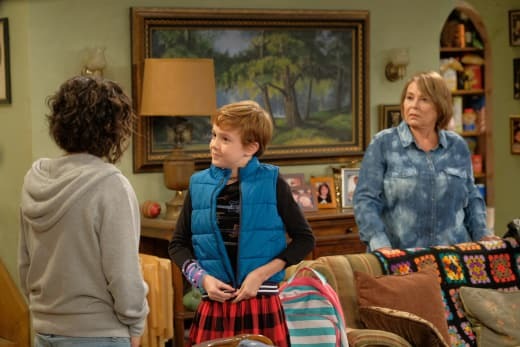 On the season premiere of Roseanne, her character and Dan found themselves smack dab in the middle of a liberal battle when their grandson decided he had a flair for colorful clothing. It was only one topic that effectively straddled the fence and proved the new incarnation of Roseanne won't be taking sides but will be showing the US and the world what it's like to be a typical American with differing views trying to understand the changes as they occur, protect the people they love while remaining true to their values. After the 2016 election, there were utterances from the networks that they might have to dig deeper to reach an audience to whom they weren't particularly paying proper attention. From what I can tell, that meant an immediate call to arms for military based programming. None of it was especially thrilling, and it didn't command the ratings bonanza a middle-class family emerging from 1997 after 20 years did. So what's the secret? Part of it is undoubtedly the star herself. Roseanne Barr doesn't have a care in the world. She says what she thinks at all times even if it ruffles feathers. Like some others who will go unnamed, she sometimes rethinks what she's said (tweeted) and deletes her more radical thoughts, but everyone knows she's human, and she's not afraid to say what's on her mind even if it might not be what's in fashion. The public knows she's not catering to a crowd to win the ratings race; she's being Roseanne. The other part is the nostalgia factor. Of course, as we know, that only goes so far. We are in the midst of the reboot/revival extravaganza and jackpots are few and far between. If we look back at 1988, the year Roseanne first hit the air, we'll see other shows that sound awfully familiar. Dynasty and MacGyver were on the schedule, as were Miami Vice, Full House, and Murphy Brown. Shows that are still recalled fondly include Dallas, The Cosby Show, Moonlighting, Family Ties, Newhart, Thirtysomething, Matlock, The Equalizer, Wiseguy, Coach, and Quantum Leap. A lot of the shows were considered family programming. While there were surely mysteries on the docket, the schedule hadn't yet succumbed to the more hard-core and grizzly types of shows like CSI. Once that hit, the examination of the victim and the psychological makeup of the killer took an entire team of individuals inside and out of the office to solve, and they were far less personable than Crocket and Tubbs, or Maddie and David. During 1996-97, warm-hearted, family-friendly fare still dominated the airwaves. Touched by an Angel, Mad About You, Hangin' with Mr. Cooper, Home Improvement, Moesha, Friends, Dr. Quinn, Medicine Woman. Some of those shows are still being bandied about for revivals. What's of interest when you compare the decades against what is currently airing? Broadcast networks aren't as fond of the feel-good shows that people could watch to unwind and feel better about life. Now they're littered with shows reminding them life is a drag, we have a lot of problems to tend, and then we'll die. Although the characters on This Is Us don't always take time to smell the roses, it is about family, as is Empire, the only other show to best Roseanne in the ratings in recent years. Viewers are eager for shows about family. I'm just lobbing a guess over the fence here, but doesn't it seem the further away from the family dynamic Empire has gone and the closer to wacko it's come the lower the ratings fall? My family has never contended with an ax murderer. We did, however, briefly consider running a music empire. Surely you see where I'm going with all of this. Reading about the Roseanne ratings, I saw mentioned that the "flyover" states tuned in en mass and it was in those states that the premiere "overperformed." In context, the term flyover was used pejoratively, as if living anywhere but New York and Los Angeles put your residency into a box that the creatives not only don't care about but they sure as heck don't want to write for you. 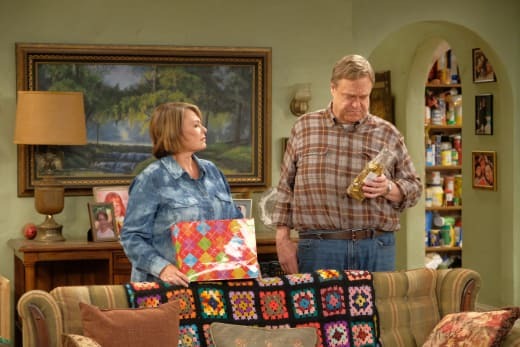 Given the shock about the Roseanne ratings, the short-sighted nature of their call to action to provide content for Middle America after the 2016 election, and the usage of terms like "flyover states," I have to wonder if many studios stop to think about the audience every once in a while. I know ABC Entertainment President Channing Dungey thought about them, at least when it comes to Roseanne. In an interview with The Hollywood Reporter, she had this to say about Middle America, "We are always, as a broadcast network, looking to market to all of America. "We wanted to remind everybody about the show using iconic things like the afghan and the couch and we really tried to be in most of the major markets where the show did well 30 years ago." It seemed like Dungey was apologizing for going after an audience to which ABC doesn't typically cater. While I don't think it's a surprise, it's an odd thing to say given the ratings of Roseanne. 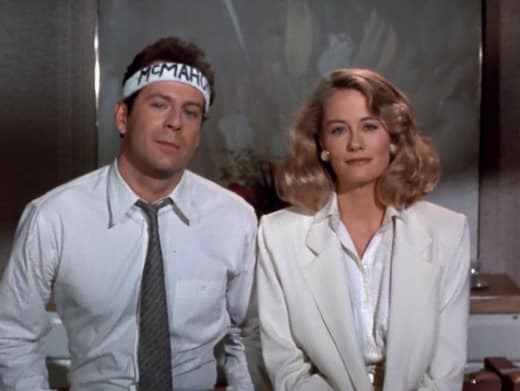 Related: Murphy Brown Set to Return with Candice Bergen at CBS!! Isn't it possible a lot more people would watch broadcast TV if they were the audience the networks were going after? Perhaps "overperformed" only meant people turned on their televisions again or that they turned off Netflix. If networks aren't even considering the audience between two slices of ocean-bound bread, then they're missing a massive part of the American sandwich. If the NASCAR audience can nab ABC a 5.1 share at a time nobody else can, every network executive should have promotions at NASCAR events. There should be a series in development about NASCAR racing, right? In fact, if we're going to look at Middle America and comfort shows, instead of forging straight ahead into the military, why not try a show about family farming? It doesn't even have to be all soft and colorful like my grandma's afghan. If you spend enough time watching documentaries on Netflix, you'll quickly discover it's a cutthroat business, and there can be devastating consequences when fellow farmers get desperate. 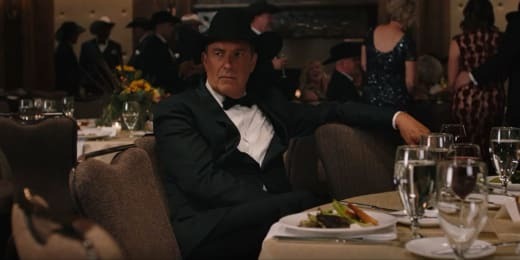 Paramount Network's Yellowstone with Kevin Costner airing this summer will be a different take on family featuring ranching, but it's not on broadcast. There is so much life in Middle America outside of office buildings and the pavement of the big cities that it's embarrassing to think our creatives are so, well, uncreative when it comes to exploring what we, as a nation, have to offer. Related: Yellowstone at Paramount Network with Kevin Costner and Wes Bentley: First Look!! They need to think outside the box. Network execs need to stop making assumptions about people who live in the states they don't visit and the people who live there and start making decisions that will garner ratings for their networks. It's not about politics or being PC; it's about providing great content that everybody can enjoy. Every show doesn't have to be all things to all people at all times. Networks should have an abundance of programming that appeals to all audiences across a broad spectrum, one unique series at a time. From my point of view, that what broadcast networks are getting wrong and what cable and streaming networks are doing right. But that comparison is for a different Corner. 27 Reboots Ruling 2018 — Should We Give Them The Boot?